Portwest 2085 Wakefield Trouser are ideal for many working environments and conditions as they are extremely comfortable and durable. They have a sewn-in crease for a smart look so they can be worn in a corporate environment. These trousers include a hook and bar closure and a jetted pocket. This product come in 2 leg lengths. Made using Fortis, 65% Polyester and 35% Cotton. Elasticated braided Headbands for extra comfort, durability and security. The cool valve installed reduces the build up of heat improving user comfort. The textured edge improves the masks fit allowing it to sit better on the users face with more grip. Supersoft lining makes this mask exceptionally comfortable. For greater comfort - Noseclip, conforms easily to the nose. 3M FFP2 Valved Respirator Mask 8322 conforms to EN 149:2001 Safety Standard. The 3M 9925 welding Respirator mask offers protection against fine particles, dusts, mists, metal fume and ozone. Designed to offer superior respiratory protection during welding operations. These masks are fully compatible with other 3M Accessories such as eyewear and hearing protective gear. The dust mask includes the 3M Cool Flow Valve, which reduces heat build-up improving user comfort. The specially treated outer-shell offers increased flame retardance. The 3M Respirator 9922 provides lightweight, comfortable, effective and hygienic respiratory protection from dust, mist and nuisance level ozone. Protects against hazards generated during welding with durable collapse resistant inner shell. 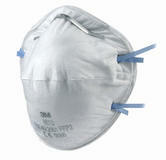 Respirator Mask in Convex shape, nose clip and twin-strap design with good fit over a wide range of face sizes. Unique 3M Cool Flow Valve. Blue colour coded straps identify FFP2 protection level, conforms to: EN149:2001 FFP2. The alphamesh A-SERIES is the first vertical fold style of disposable respirator to feature the alphamesh shell, preformed nosebridge and be completely metal free. Alphamesh shell - supports the filter media, maintains shape and prevents collapse. Offers improved comfort and fit with the retention of shape even in extreme conditions. Preformed nosebridge, provides comfortable fit eliminating the need for regular adjustment. Utilising the latest filter technology - promotes low breathing resistance. Adjustable clipped headstrap - enhances good fit and allows respirator to drop away from face when not in use. Low profile valve - aids field of vision and reduces heat and moisture build up within the respirator. Individually packed - to prevent contamination and permit convenient storage in the pocket or toolbox. Alpha Solway Alphamesh A-2V A-Series Valved Respirator conforms to: EN149:2001+A1:2009 FFP2 NR - incorporating the requirements. Pack of 20 Alpha Solway Alphamesh A-2V FFP2 NR Respirator Masks. Alphamesh shell maintains shape and prevents collapse onto the face. Utilising the latest filter technology. Wide, continuous loop head strap. Adjustable clipped head strap: allows respirator to drop away from face when not in use. Low profile valve: reduces heat and moisture build up within the respirator. 100% metal free: suitable for food industry applications. Individually flat packed: to prevent contamination and permit convenient storage in the pocket or toolbox. Alpha Solway Alphamesh A-2CV A-Series FFP2 Valved Respirator conforms to EN149:2001+A1:2009. Specially designed for welding applications, this respirator protects against oil and water based mists, fine dusts, metal fumes and ozone. It has a robust cup & shell design, to make it collapse-resistant. Flame retardant, anti-clog, outer surface minimises the detrimental effects associated with welding splatter. Carbon layer provides protection against Ozone gas (10x TLV) and nuisance levels organic vapours (below TLV). Soft inner face-seal ring (9928 only) improves face seal, wearer comfort and allows for hygienic cleaning if used for longer than one shift (use 3M™ 105 Face Seal Cleaner). 4 point adjustable braided headbands help achieve a more secure feel and provide comfort to face, head and neck. Designed to fit well on most face shapes and sizes. 3M Cool Flow Valve stops heat build up & provides more comfortable, cooler wear. Pack of 103M 9928 Welding Disposable Masks conforms to EN149:2001 FFP2 NR D Safety Standard. This FFP2V respirator protects against fine hazardous dust particles and light metal fume. Exhalation valve reduces hot air buildup. Latex-free head straps for comfortable wearing. 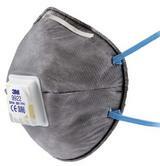 Arvello CDC3V Disposable Dust Masks Valved FFP2 conforms to: EN149:2001+A1:2009 standard. Supplied in box of 10 respirators. This FFP2 respirators are ideal when working with dust, mists and fibres. They are suitable to protect against dust, mists and fibres. Arvello Disposable Respirators FFP2 Conforms to: EN149:2001+A1:2009 FFP2 standards. Pack of 20 Arvello Unisex Disposable Dust Masks. Innovative compact folding mask with 7 dynamic parts allowing excellent facial movement with maximum comfort. Valved and with inner foam for increased comfort for the wearer. 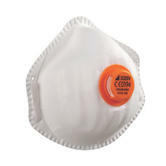 Protection against slightly toxic or irritating dust, smoke and aerosols. The 3M 8822 P2 Valved dust/mist respirator offers protection when exposed to fine respirable dusts, fibres and water/oil mists. The mask decreases heat build up with it's 3M cool flow valve, making it suitable for working in humid and hot conditions. This lightweight respirator mask can comfortably fit a great variety of facial shapes and sizes. The twin straps are made of natural rubber and materials used in the mask includes a steel nose clip and polyurethane nose foam. Conforms to EN149:2001 safety standard. 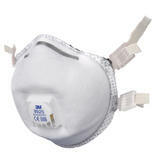 3M dusts mask 9320 FFP2 for respiratory protection against dusts and mists found in a wide variety of industrial applications and other work situations requiring FFP2 protection. Unvalved Dust Mask is a folding filtration respirator without any respiratory valve. Excellent fit over a wide range of face size, very comfortable and lightweight. A sculpted nose panel for improved compatibility with eyewear. 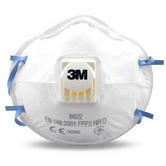 3M FFP2 Unvalved Dust Mask Respirator 9320 conforms to EN149:2001 Safety Standard. The 3M Aura 9322 FFP2 valved respirators are high quality, providing great protection. Dust particles and non-volatile liquid particle resistant. The Cool Flow valve means the 3M Aura 9322 is perfect for use work in hot and humid conditions. These masks do not provide suitable protection against harmful gases. 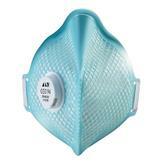 3M 9322 FFP2 Valved Respiratory Mask conforms to EN149:2001 Safety Standards. 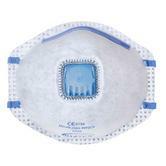 Pack of 10 3M 9322 FFP2 Valved Respiratory Masks. This Moldex FFP2 Disposable Face Mask is designed to protect users against toxic fumes, dust and water, as well as aerosols and oil-based mists. 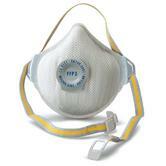 FFP2 Level Mask provides 10 times more protection of the WEL (Workplace Exposure Limit). 100% PVC free products and packaging – so they are better for your health as well as the environment. Moldex ActivForm® technology automatically fits the mask to your face with no manual adjustments required assuring you of a safe and secure fit. Produced with Moldex DuraMesh® material for a durable, strong structure that lasts. Adjustable straps allow you to put the mask on and take off quickly and easily. Special Ventax®-Valve reduces heat and moisture instead the mask for increased comfort. 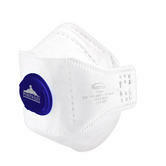 Moldex 2405 ActivForm® Dust Mask conforms to: EN 149:2001+A1:2009. Alpha Solway Alphamesh 8020V FFP2 Mask. 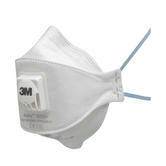 Has been developed to improve the comfort of disposable respirators. Fully adjustable and clipped headstrap, excellent face fit. Reduces heat and moisture build up within the respirator. Allows respirator to drop away from face when not in use. Alphamesh shell: prevents collapse onto the face. 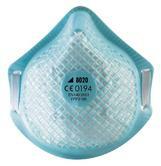 Disposable mask for protection against fine toxic dust, fumes and oil and water based mists e.g. Brake Dust, Concrete Dust, Lead Dust and Fume, Welding, Wood Dust, Zinc Oxide Fume and Aluminium Oxide, Brick Dust, Cellulose, Cement, Pollen, Sugar. 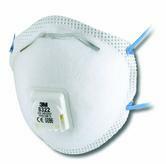 Alpha Solway Alphamesh 8020V FFP2 Mask conforms to EN149:2001+A1:2009 Safety Standards. The washable full face seal and unique pleated filter technology gives you the option of using these masks for more than one shift. Moulded respirators, provide protection against all dusts, and oil & water based mists and fumes, plus Ceramic Fibres, Chromates, Chromium, Cobalt, Nickel, Micro Organisms, Radioactive or Biochemical Active Substances. 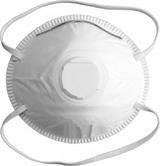 Suited to most industrial applications this general purpose mask is strong and durable. Moulded respirators, provide protection against fine toxic dust, fumes and water based mists only e.g. as FFP2 but at higher concentrations, plus Ceramic Fibres, Chromates, Chromium, Cobalt, Nickel, Micro Organisms, Radioactive or Biochemical Active Substances. Protects against fine toxic dust, fumes and water based mists. 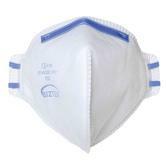 Disposable mask FFP2 level, protects against solid and liquid particles of average toxicity. Minimal % of filtration 94%. 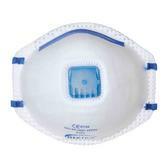 Disposable mask FFP2 level, protects against solid and liquid particles of average toxicity. Activated Carbon layer for improved absorption of nuisance organic vapours and odours. 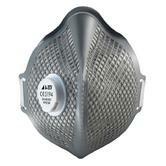 The Moldex Air Mask P2 (3100) is made with pleated filter technology, with a 260% increase of filter surface space. 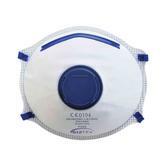 The reusable dust mask is designed with a higher filter capacity which helps reduce the breathing resistance. 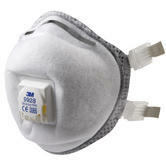 Moldex 3100 FFP2 Disposable Dust Masks are tested and certified to EN 149:2001+A1:2009 FFP2 NR D standards. Workwear that is designed right, should fit as easily as weekend wear! Your workwear should facilitate your work, yet still protect you discretely. Your workwear should look Smart. You want to feel great about yourself when you zip up. Call it "safety clothing" or "workwear" or "Personal Protective Equipment" (PPE) - we supply it ALL! We have 70+ years of workwear experience. Our range of workwear trousers includes the best styles from Caterpillar workwear, Dickies work trousers, Snickers workwear, and Tranemo. Our range of boilersuits and coveralls is truly vast: we have over 40,000 FR coveralls in stock! We have a wide selection of regular polycotton overalls from leading brands such as Dickies and Portwest. We have womens workwear, as well as over 100 styles of ladies safety footwear. Did we mention that we have 500+ styles of safety boots, safety shoes and safety wellies, safety trainers in stock now, for same day despatch? Our PPE is certified to the relevant EN norms. We have info on PPE regulations in our blog. We are committed to supplying the best branded safety and protective workwear: We are the Official distributors for 100+ leading workwear brands - such as Ansell, Bulwark, Caterpillar, Dickies, Wenaas etc. We strive to keep our prices so highly competitive that you don't need to look elsewhere. Workwear Express: Need your workwear in a hurry? - We are totally committed to delivering protective workwear to your doorstep quickly. We sell from stock. We have a vast £4m of safety equipment at any one time. So, 99.5% of our orders are despatched same day. Typically, you get your safety workwear within just 24 hours! Workwear Embroidery? - We can put any logo on any workwear garment: we have our own heat seal and embroidery machines, all inhouse: for speed and accuracy. Remember: when you spend £70 or more, UK shipping is absolutely FREE.